Robot Mode: Brawn might be the tallest of the G1 Minibots. The entire length of his vehicle mode becomes the legs, making him nearly twice as tal as his vehicle mode is long. 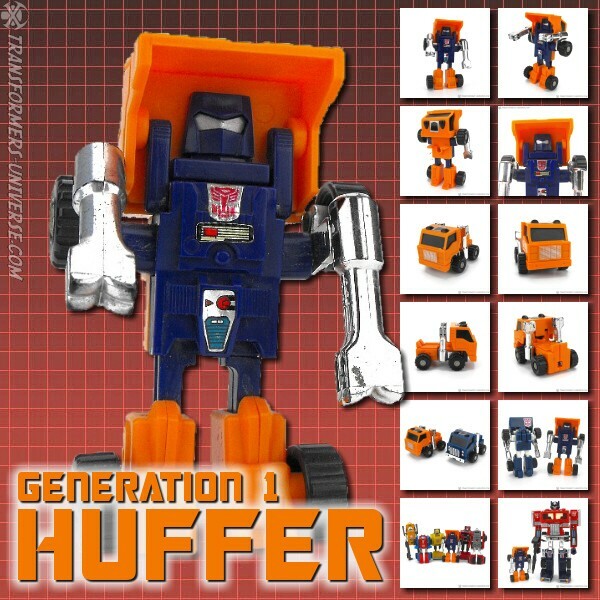 He might also be the G1 Minibot with the least resemblance to his cartoon counterpart. Where cartoon Brawn was a squat, sturdy fellow, toy Brawn comes with long, relatively spindly legs and arms that are little more than short stubs with claws at the end. He's also lacking a humanoid face. So while there is some general resemblance, toy Brawn really doesn't look all that much like cartoon Brawn. As a figure he has several problems as well, chief among them his thin legs, which give him some stability problems. Bottom line, not the best of the G1 Minibots. Alternate Mode: Brawn transforms into an off-road jeep and looks pretty good doing it. There is a fair amount of detailing, especially considering his small size, and the vehicle offers little clue as to there being a robot inside. A decent vehicle mode, no complaints. Remarks: Brawn was one of the most likeable Autobots of the early Seasons. The tough little guy, always ready to take on bigger opponents and usually coming out on top. In the episode "The Ultimate Doom" he took apart half of the Decepticon troops on Cybertron all by himself. My favorite scene had him saying "I'll get the door" which he then did by running through it without slowing down. Sadly Brawn perished in Transformers the Movie (1986) from a single blast to the shoulder by Megatron's fusion cannon. A controversial ending of this lovable 'bot as earlier episodes had Brawn take point-blank shots from Megatron and suffering only very little damage. There is even some debate that he might have survived, seeing as he briefly appeared in the season 3 episode "Carnage in C-Minor", though that was probably an animation error. As a figure, though, Brawn isn't exactly living up to his character. His robot mode suffers from multiple problems and while his vehicle mode is decent, it can't make up for that. I got him because of the character and I don't regret it, but judged only by itself, the figure isn't really worth getting. So I can only recommend it to Brawn fans such as myself.